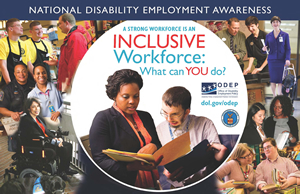 Many people equate October with breast cancer awareness, but it’s also National Disability Employment Awareness month, too. It’s the ideal time to turn our attention to disabilities and the struggles millions of Americans face every day. Specifically, young people are often the most challenged as they’re not only trying to figure out who they are, they’re also trying to figure out where their disabilities fit in their lives. This national campaign dates to the mid-1940s and initially, included the word “physical”; however, two decades later, that was removed as many were concerned those non-physical disabilities were going to the wayside. Now, the goal is awareness, education and change for all disabilities. To be sure our young people with hearing disabilities are able to transition into the careers they choose, it’s important to take advantage of any efforts at widespread recognition and programs such as these ensure the message is widespread and far reaching. According to the National Institute on Deafness and Other Communication Disorders, two to three out of every 1,000 babies born in the United States every year are born deaf and 90% of those babies are born to parents who have no hearing disabilities at all. The numbers are growing every year, but as of the most recent data, close to 26,000 children under the age of 18 now have cochlear implants. As the advances in these implants continue to expand, there’s real hope in what the future might mean to the hard of hearing community. Not only that, but it’s believed up to 6% of deaf babies and another 6% of hard of hearing babies have Usher Syndrome – that averages out to about four of every 100,000 births in the United States. If you’ve not heard of it, you’re not alone – and this fact is further justification that awareness is key. One of the most frightening aspects of this disorder is the progressive nature of it and many children aren’t sure how this disorder will affect things like going to college and finding the career they’re passionate about. In Type 1, children are born deaf and virtually all experience significant problems with balance. Unfortunately, hearing aids often do not help these babies nor do they throughout their lives. Proper intervention is key as communication is crucial, especially between parent and child and while it’s frustrating for these little ones, their parents are also unprepared for what this syndrome means in terms of how they raise their child, including a slow learning curve for things like supporting themselves as they’re learning to sit up, crawl and walk. In Type 1, vision problems begin before the children are ten years old and from there, their sight fails until they are completely blind, too. Type 2 isn’t as aggressive as Type 1, but these babies are still born with varying degrees of hearing loss. What they are able to accomplish usually is the ability to balance themselves. They also find it easier to communicate with the aid of hearing devices. The loss of sight is slower too, though complete blindness occurs. These babies are born with normal hearing; however, they often develop balance problems as they grow into adolescence. Still, both their hearing and vision worsens to the point they’re virtually always declared both legally deaf and legally blind by the time they reach adulthood. Wondering what you can do? Teachers and other professionals who deal with children are encouraged by the NDEAM to keep the lines of communication open and to foster open discussions. Some teachers also incorporate class displays, assemblies to discuss various disabilities facing children, including hearing loss, and finally, simply reaching out to these young people is a powerful way to let these kids know that they have someone on their side. For a child with hard of hearing issues, that is a major bonus. What else can you do? Visit the Department of Labor site for poster printouts and other resources.